The ITER cryogenic facilities. Within the 5,400 m² Cryoplant Building, more than 3,000 m² are reserved for the three identical LHe plants that will work in parallel to provide ITER's superconducting magnets and cryosorption panels with the cold environment they need. The Final Design Review for ITER's liquid helium (LHe) plants was held on schedule and on budget at ITER Headquarters from 12 to 14 November. This important project milestone now opens the way for helium plant manufacturing to begin. The ITER superconducting magnets and cryosorption panels operate under extremely cold conditions (-269 °C, or 4.5 °C above absolute zero). At such temperatures helium is the only option, remaining in a liquid state when oxygen, nitrogen and even hydrogen would freeze. The LHe plants—by providing a total average cooling capacity of 75 kW at 4.5 K, corresponding to a cumulated liquefaction rate of 12,300 litres per hour—make ITER a world-class helium liquefaction facility. The plants will be able to refrigerate 10,000 tonnes of ITER magnets (as a point of reference, the metal structure of the Eiffel Tower weighs 7,500 tonnes). The plants will also provide liquid helium to the cryosorption panels, whose role it is to evacuate helium ash from the fusion reaction and to ensure the required vacuum for one of the largest vacuum systems ever built (cryostat: 8,500 m³, vacuum vessel: 1,400 m³). 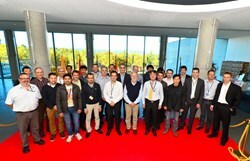 The Final Design Review for ITER's liquid helium (LHe) plants was held on schedule and on budget at ITER Headquarters from 12 to 14 November 2014. The contract for the LHe plants was awarded by the ITER Organization to Air Liquide advanced Technologies (ALaT) in December 2012. Since then, ITER Organization Cryogenic System Section and Air Liquide have teamed up to design a system tailored to the needs of the magnets and cryosorption panels. The system is designed for all operation phases, from warm state to cold operation, and will be able to handle the large load fluctuation resulting from magnet current pulses and cryosorption panel regeneration. 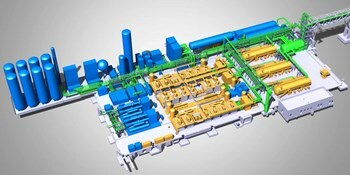 The integration of the plants in the ITER environment was also a challenge. A building the size of a football field (45 x 120 m) will house the three identical LHe plants that will work in parallel. Within the 5,400 m² Cryoplant Building, more than 3,000 m² are reserved for the LHe plants. The design reviewed last week covered all interfaces with utilities such as electricity and water, for which the LHe plants will be one of the major users. In order to compress the cycle gas, the LHe plants will require about 24 MW (the approximate electrical needs for European city of 25,000 habitants); while removing the heat resulting from this compression will require 1,800 m³/h of cooling water (the approximate volume of one Olympic swimming pool per hour). To enhance the overall system efficiency, a heat recovery system has been implemented to recover about 12MW that will be used to warm ITER buildings and offices. Savings analysis in terms of cost and energy has demonstrated the benefits of the heat recovery system. The key components, including the turbo-expanders and the brazed aluminium heat exchangers, are housed in ''cold boxes''—large vacuum vessels that will provide the insulation required for operation. Each 4.2 x 21 metre cold box will weigh about 135 tonnes once all internal components are integrated. After 21 months of studies and the combined efforts of the ITER and Air Liquide teams, the design of the LHe plants has reached sufficient maturity to move forward to the manufacturing phase. The Final Design Review was the opportunity to demonstrate the quality and thoroughness of the work performed during the design phase. Representatives from the ITER Organization, Air Liquide advanced Technologies, the European Domestic Agency, and ITER India reviewed all aspects of the design from process calculations and equipment selection to 3D models. 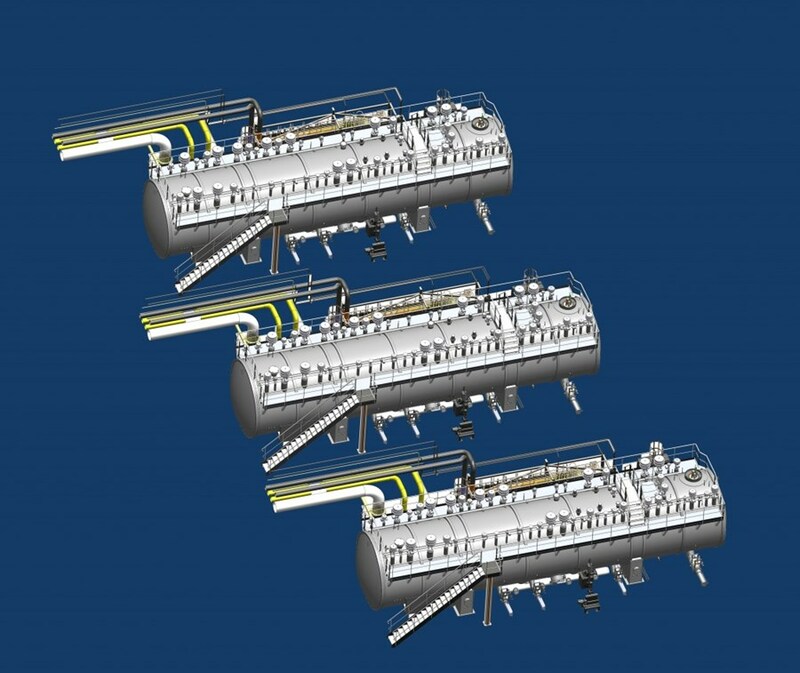 The LHe plants will rely on a total of 18 large oil screw compressors that will be manufactured in Japan, 12 cryogenics turbo-expanders from France, and high efficiency aluminium brazed heat exchangers (France). The cold key components, including the turbo-expanders and the brazed aluminium heat exchangers, are housed in "cold boxes"—large vacuum vessels that will provide the insulation required for operation. Each 4.2 x 21 metre cold box will weigh about 135 tonnes once all internal components are integrated. The three cold boxes will be assembled at the Air Liquide Advanced Technologies workshop in France. Story developed with the collaboration of Frederic Andrieu, project director at Air Liquide advanced Technologies (ALaT).